London Design Festival 2015: the studio run by Dezeen columnist Sam Jacob has designed an urn for Lenin, based on a finial found outside the London house the Russian revolutionary lived in for a short period in 1908. Lenin's Urn was designed by London-based Sam Jacob Studio as part of the "pieces" exhibition at the Soane Museum in London, which brings together a showcase of work created by artists and designers in response to the museum's collection of ancient sculpture fragments. Five artists and designers have contributed work: Jacob, Paul Elliman, Gemma Holt, Peter Marigold and Study O Portable. 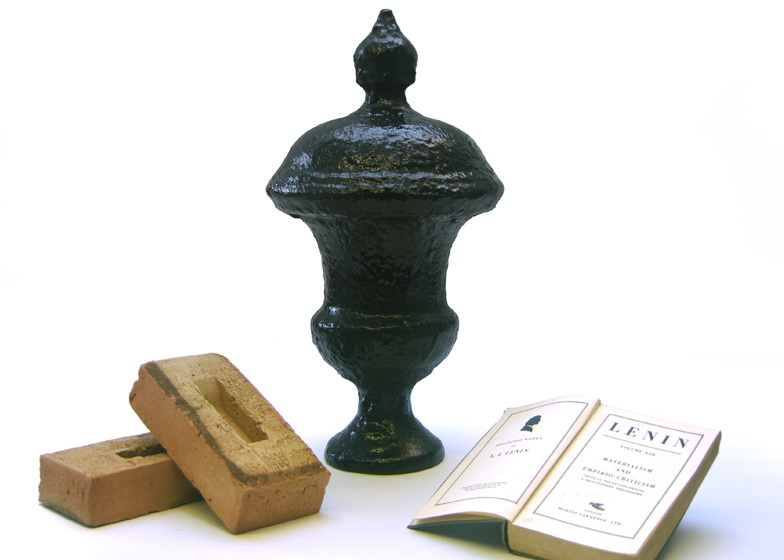 Lenin's Urn explores "the effect of history on objects", and takes its cue from the shape of a Victorian railing finial outside the Tavistock Square house inhabited by Vladimir Lenin – the communist politician that led Russia and then the Soviet Union from 1917 until 1924. The finial was 3D-scanned, enlarged and then carved on a computer-numerically-controlled (CNC) router to produce a faithful recreation of the original object. "Through this change in scale the familiar becomes stranger. We see the architectural figure of the urn – on which the railing finial was originally based – return to its 'real' size," said Jacob. "Even as it becomes more real it enlarges the transformations of wear, repair and layer upon layer of repainting that, over the years have altered its original form." "These are objects created over time, pieces of urban fabric that, like tree rings, tell their own story of their presence in the city," he added. "In their vagueness, in their sense of shrouded form we might feel some vague-shaped ghost of Lenin's presence, somewhere down amongst their base coat." Study O Portable – which has previously made giant bangles shaped like pineapples – created a set of glass blocks, sections of which have hand-painted to resemble wood. The glass blocks have been used to support larger panels. Gemma Holt's Arranging Marbles is composed of a set of geometrically shaped pieces of marble that have been placed together – a reference to Soane's own tendency to arrange and perfect displays from his collection. Dezeen previously covered Holt's pencil-shaped jewellery, which she created while still a student at the Royal College of Art. Three pieces by artist Paul Elliman are on display, each using found objects to reflect on ideas of currency and time. Peter Marigold – whose past work includes "bleeding" cabinets and a coat stand created from a ready-made 20 litre liquid container – has also used found objects in his Timbrephone, a xylophone-like instrument composed of objects organised according to timbre. The pieces – on display in the museum's No.12 Breakfast Room – are intended as a reinterpretation of the Soane's collection of artefacts and is focused around the concept of "the fragment". "Each ancient fragment within the museum suggests an incomplete, yet intriguing picture of the whole," said curators Tetsuo Mukai and Bernadette Deddens. "The objects offer tangible yet imperfect insights into the past, while the incomplete pictures they leave prompt discussion and interpretation. The exhibition explores the idea of how the incomplete could shape the complete," they added. Officially called Sir John Soane's Museum after the British neo-Classical architect, the institution is located in his former home on Lincoln's Inn Fields. The exhibition will be on show until 26 September 2015 as part of this year's London Design Festival, which takes place from 19 to 27 September – read Dezeen's guide to the top ten installations and exhibitions to see during the festival.